Incredibly honored to have “Warm Bones (For Agnes Martin)” included in UNTITLED (House), an exhibition of the Diane and Browne Goodwin Family Art Collection at the Illinois State Museum, Lockport Gallery. The quilt is a damaged and discarded worker’s quilt that I’ve inadequately repaired with gold straight stitches. The gold thread is old-new stock from Japan and was once used to make the shimmery gold elements in kimono and obi. It is incredibly delicate and breaks easily, as it’s made of paper with gold leaf pressed on it. The exhibition includes work by wonderful artists and friends, including Joanne Aono, Robert Burnier, and Sherri Denault, and is curated by Lauren Ball, Erik Wenzel, Gwen Zabicki, and Robin Dluzen. Opening reception is October 28, 2-5PM. My work is included in Altered, a four-artist show at Prairie State College’s Christopher Art Gallery curated by Beth Shadur, featuring work by myself and Katsy Johnson, Javier Chavira, and Rose Camastro-Pritchett. I’m showing Last Fisherman and Dark Waters, two image/text pieces from the Dream of Water project and series. If you attend the show, let me know what you think! I’m honored to have two poems from my Ruins of Modernity series published in The Magazine Santa Fe. These poems were extracted from an essay by Dr. Shannon Lee Dawdy, “Clockpunk Anthropology and the Ruins of Modernity,” about the aftermath of Katrina in New Orleans. Shannon is an archaeologist, filmmaker, theorist, and exceptional thinker, who I’ve had the pleasure of getting to know after meeting her in Oaxaca. Many thanks to editor Gabe Gomez for including my work. Joanne Aono and I will be exhibiting work in our two-artist show, “Attention Is the Beginning of Devotion,” at The Victorian House Art Gallery, a unique venue run by curator and artist Sherri Denault. Please join us! Betty Cleeland and I are opening our studio on Saturday, June 18, for Mana Contemporary’s Summer Open Studios. Join us to see our newest work and some of our older work (for sale!) and visit the other studios and happenings around the building. It will be a great night of exceptional art! 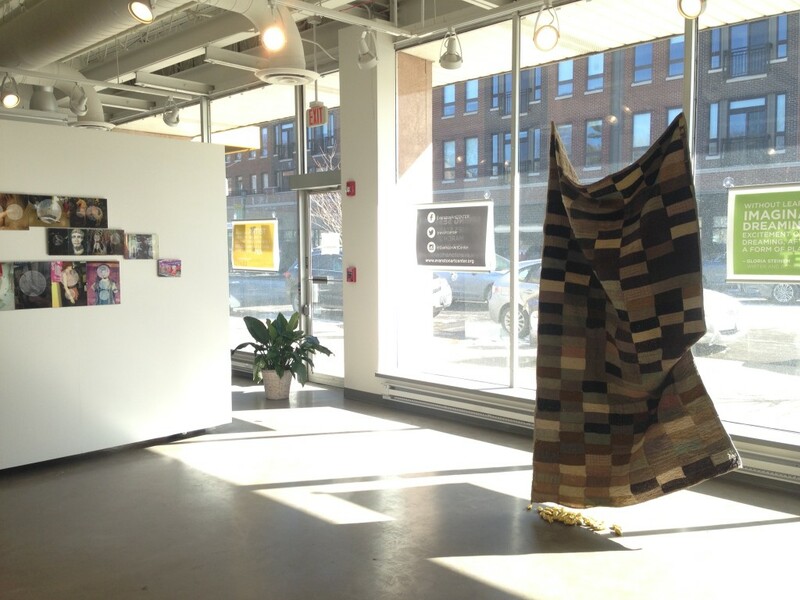 My embellished mourning quilt, The Relatively Brief Preponderance of Moments, is currently on view at the Rockford Art Museum’s Midwestern Biennial, curated by Sarah Krepp, through September 25, 2016. Read more here. Artist and curator Connie Noyes included my piece, Drunken Forest: View from the Chromosphere, in Taking Shapes, a group exhibition at the Hyde Park Art Center. On view until August 16. Joanne Aono and I are collaborating on an interactive performance/installation at Perry Farm in Bourbonnais, Illinois. Curated by artist Sherri Denault, we will be presenting installations with Denault, Margie Sula, and Patty McWilliams during the park’s annual Nightscape extravaganza August 26. The installations/interactive works will be on view through October 7, 2016. More info to come on my website and on Facebook. Meet me at the Mending Wall, an interactive performance involving graphite, erasers, and collective action. Recognizing that the act of erasure can be an act of healing, and that communities are built on the support and assistance of others, this collective erasing is a direct response to the suffering around us, an offering to come together and work on a challenging task. Visitors are invited to erase their regrets, desires, prayers, or any message that needs attention or mending into the graphite, or to simply help erase the graphite from the wall wordlessly. Graphite is messy and difficult, if not impossible, to erase completely, yet the act of erasing gives us the opportunity to slow down and thoughtfully work together. Echoing the final blowing away of a sand mandala painting, or the washing and cleansing that follows any act of disruption or violence, the mending wall is a drawing-by-erasure made communally, containing the personal and collective in one action. When: Mana Contemporary Open House, February 21, 2016, 12-4PM and through February 28. 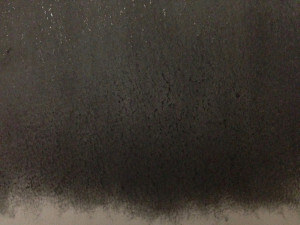 I will be installing the graphite on February 19 and 20, 11-4. Stop by if you’d like to help. If you can’t make the opening on the 21st, come by anytime during the week to erase your message into the wall and participate in this erasure meditation.